War is a recurring theme for poet Dunya Mikhail, an Iraqi exile who fled her country after being placed on Saddam Hussein's enemies list. She wrote her first poems as a teenager in Baghdad, just as the slaughter of the Iran-Iraq War began. Subsequent wars offered more to write about. One of Mikhail's collections is called The War Works Hard. It's also the name of a poem with an ironic take on the meaning and consequence of war. Mikhail, who now lives in the United States, wrote that poem in response to the Persian Gulf war of 1991. "When I think of war, for me, it's by default a ... lose-lose case," the poet says. "I believe there's no winner in the war because, you know, the killed one dies physically and the killer dies morally. So they are both dead." For Mikhail, writing about war is not necessarily a way to heal wounds, she says. "On the contrary, it keeps [them] open forever," Mikhail adds. "Poems are like X-rays. It makes you see the wound and understand it." in all other trembling hands. his skull, not like any other skull. in a place where the darkness plays all this silence? with all of these hollow places? on the occasion of birth? when he takes your life? a balloon that never pops. not like any other skull. The dictator is the director of a great tragedy. who has not yet found her own. return it to me please. 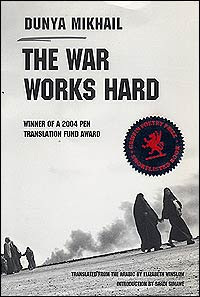 From The War Works Hard, published 2005 by New Directions. Copyright © 2005 by Dunya Mikhail. Translation copyright © 2005 by Elizabeth Winslow. Used by permission of New Directions Publishing Corp.